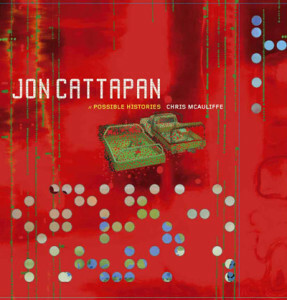 This book traces the art of Jon Cattapan from Dadaist grotesquerie and surrealist erotica of his student days to current explorations of global information flows and urbanism. Written in close collaboration with the artist, the book contains extensive artist interviews and statements drawn from the 1970s through to the present, as well as numerous illustrations of Cattapan’s source materials and working processes. Drawing on Zygmunt Bauman’s model of ‘liquid modernity’ the text explores the artist’s efforts to model the weightlessness and mobility of postmodern experience and an ‘increasingly mobile, slippery, shifty, evasive and fugitive power’. Published by the Miegunyah Press through Melbourne University Publishing, 2008.